The restrictions were introduced on 28 March 2018 - shortly after the conclusion of a national conference which recommended changes to the constitution, to allow President Idriss Deby to remain in power until 2033. The mobilisation proved effective, as according to the BBC's Vincent Niebede in the capital, Ndjamena, many Chadians were using social media to organise anti-government protests. 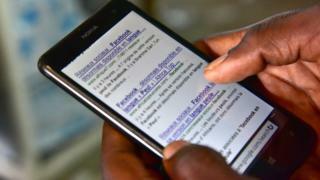 One prominent Chadian blogger Deuh'b Emmanuel, told the BBC: "Without Facebook, without access to social media, it's like being in prison without a cell." However, the ban only affects a small number of people in Chad - just 4.9% of the population regularly accesses the internet, according to data gathered by Internet World Statistics. On Wednesday, government spokesman Oumar Yaya Hissein told our reporter that the ban had been imposed for "security reasons". It seems highly unlikely. A group of Chadian lawyers took telecommunication companies to court in August 2018 in an attempt to restore social media access but lost the case. The lawyers appealed but the appeal court on Thursday dismissed their case, citing "security reasons" for the social media cut.